During the Saturday-morning foursomes matches at the Presidents Cup last month, my boss, Matt Kuchar, and his partner Dustin Johnson faced Adam Scott and Adam Hadwin. As we played the 9th hole, a par 5 with water fronting the green, we were 3 up and in total control. Dustin launched our second shot just short and right of the green, leaving Matt an eagle pitch. As the guys waited in the fairway for the Internationals to play, I strolled up to the green to assess Matt's shot. Hadwin was preparing to hit a wedge from about 100 yards. As he settled over the ball a fan behind me hollered, "Hit it in the water, you Canuck!" I don't think Adam or the rest of his group heard the heckler, because they didn't react. Incredulous, I turned to the fan and said, "Really? You think we need that right now?" As an American caddie for an American golfer, there is nothing I enjoy more than representing my country. I've been a part of 12 Ryder Cup and Presidents Cup teams, plus one Olympic team. I've been luckier than I could have ever imagined, and those events mean more to me than anything else I've done in my career. I'm so thankful. 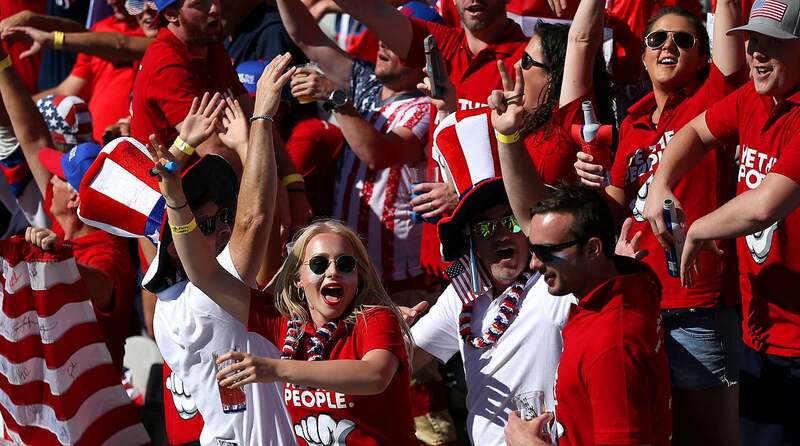 But during the last couple of team events in the U.S., I've noticed a troubling trend: harsh treatment of opposing players by a small but increasingly vocal and aggressive group of fans. I think if you asked teammates of mine, caddies and players alike, you'd get a nearly universal opinion that I want to win these things more than most, maybe too much. Had Paul Azinger or Davis Love or Fred Couples or Steve Stricker pulled me aside at the beginning of their respective captaincies and said, "Hey, Woody, before the week gets started, would you please run through that brick wall for me?" I would have been caddying with bruised knees and a separated shoulder. Let me be perfectly clear, I am no saint. When an opponent misses a short putt or hits a ball into a hazard to give us a hole, I unleash a little internal fist pump. I want to Win. Did I feel guilty when we led 8-2 after two days at the Presidents Cup? Absolutely not. We outplayed them. The score was the score. But was I embarrassed that some of our supporters yelled profanities and insults at the European and International teams? Absolutely. I heard similar jeers at the Hazeltine Ryder Cup last year. Here's the thing: None of this helps us win. And even if it did, we wouldn't want to win that way. We don't want to win because someone called one of our friends—yes, our opponents are also our friends—a vile name as he walked to the 17th tee of an all-square match. Patrick Reed doesn't need anyone to catcall his opponent's wife. Jordan Spieth would rather lose a hole than have his opponent unable to execute a shot because someone shouted in his backswing. Matt Kuchar is as fair a person I've ever encountered in golf, and I can promise you he wants to win his match by making birdies, not by having his opponent ridiculed. Listen, I understand our supporters' fervor and appreciate it when it's properly channeled. We love boisterous fans who scream for us on the 1st tee, chant "U-S-A," and high-five our guys for winning a hole. Bring it on. We love it. It helps. The ridicule and personal insults? They embarrass us. All the U.S. players, caddies, wives, officials, captains, and assistant captains cringe at the personal insults. It bothers us when we have to ask someone to show respect to a European or Australian as they play their shots. I don't want to disrupt my player's routine by stopping to direct security to a fan who disrupted a player as he tried to play a golf shot. (Say that aloud: as he tried to play a golf shot.) I realize this is less than 1% of American fans, but my hope is that the other 99% would be brave enough to step in and help. Those of us inside the ropes can do better, too. When we hear the insults, we could stop play and identify the offender. We could walk over to our opponent and apologize, and tell him that we don't feel the same way. We could even take it a step further and concede the hole after a personal attack directed at one of our opponents or their wives. We could walk over to the rope line and say, "We lost that hole because of what you said. So, thank you." Don't get me wrong, when we go on the road for a Ryder Cup in Europe or a Presidents Cup, it's not a pleasure cruise. Being visitors in an away game is tough, as it should be. Those crowds are boisterous and partisan. They want to beat us, and they let us know it. But overseas it has rarely gotten personal. I don't have a problem with crowds clapping when a player misses a putt or hits a poor shot to give their team a victory on a hole or in a match. That's a natural human reaction. These guys are professionals, and have developed thick skin. But Hadwin or Marc Leishman or Rory McIlroy should never have to endure personal attacks. No one should have to worry about their son or daughter watching a golf match for fear of their dad being called a choker, or much worse. If you've ever yelled something like this, put yourself in the shoes of the players' loved ones. If it were your son out there playing and a fan unloaded on him, would it not just crush you? Would you think it was OK? Imagine if you were actually competing and your 12-year-old daughter was with her mom, your wife, watching you, and someone calls you a "f---ing choker." Is your heart broken yet? Win or lose at these team events, the post-match press conferences and analyses would be much more enjoyable for the players if the only story was the golf. Our guys would much rather discuss their teammates, their captain, the camaraderie. After one of these unforgettable weeks, the last thing they should have to do is answer questions about fan behavior. Being partisan and passionate should not preclude us from being polite and respectful. We can all be better. John Wood has caddied for Matt Kuchar since 2015. He is a regular contributor to our weekly Tour Confidential roundtable.